Madison, Wisconsin - Both the number and the percentage of traumas reported at the adult Level I trauma center at University Hospital increased substantially from 2017 to 2018. In 2017, the hospital saw 2,285 cases of trauma; in 2018, that number was 3,245 - an increase of 42 percent. "As a Level I trauma center, we receive the most seriously injured patients," said Dr. Ann O'Rourke, director of the trauma division. "Forty-four percent of the patients reporting to the emergency department in 2018 had traumatic injuries, while 27 percent of emergency department visits were traumas in 2017." University Hospital has the only trauma center verified as a Level I for adult, pediatric and burn care. A Level I center is prepared to provide total care for every aspect of traumatic injury. In addition, the burn center at University Hospital is the only verified burn center in Wisconsin. 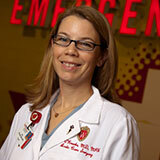 Among other requirements, the Level I trauma center requires 24-hour in-house coverage by 10 medical specialties. "Our specialized hospital is distinguished by the immediate availability of specialists, equipment and services," said O'Rourke. "The risk of death is 25 percent lower at a Level I trauma center as compared to Level II trauma centers, which have a death risk of 15 percent lower compared to non-trauma centers." Ninety-three percent of traumas in 2018 were blunt injuries such as motor vehicle collisions, all-terrain vehicle mishaps and falls. The other category of traumas is penetrating (gunshot wounds and stab wounds). That category made up six percent of traumas last year. In 2017, blunt injuries made up 95 percent of traumas and five percent were penetrating traumas. In both years, 91 percent of traumatic injuries required surgery, which means almost 3,000 patients had surgery in the two years combined. "The bottom line is that these numbers show our Level I trauma center is busy, but always prepared for some of the worst injuries," said O'Rourke.